New York Estate Attorney. Estate, Probate, Wills and Trusts. Long Island, Nassau, Suffolk, NY. Inheritance & Probate Law for over 35 Years. 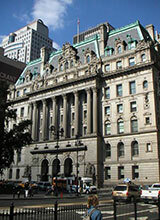 The New York Law Firm of Mitchell Wilensky limits its practice to New York estate, probate, inheritance and trust law. The firm's expertise and extensive experience within its practice concentrations allows it to distinguish itself from those attorneys that are more "general practice" oriented. Whether it is a simple uncontested matter or complex estate litigation, the New York Law Firm of Mitchell Wilensky has the experience, skills and knowledge to achieve superior representation, and to make certain that the interests of its clients are always paramount. For over 35 years Mr. Wilensky has provided quality representation and personal attention in protecting and securing the rights of his clients in New York probate, inheritance, and estate matters in Manhattan, Brooklyn, Queens, the Bronx, Westchester, Long Island (Nassau & Suffolk counties), and other New York counties. A sizeable percentage of our clients do not reside in New York State. National demographic factors have impacted many traditional New York families. Family members that have "migrated" out of New York who now require legal representation for New York inheritance, probate, and estate matters can successfully be represented by Mr. Wilensky with the utilization of electronic mail, overnight delivery services, and video conferencing. Mr. Wilensky received the 2017 "AV" Preeminent Rating through the Martindale-Hubbell peer review selection process. The "AV" Rating is the highest possible rating awarded by Martindale-Hubbell for Legal Ability & Ethical Standards and is a testament to the fact that a lawyer's peers rank him or her at the highest level of professional excellence. If you are named as an executor in a Will and are seeking an attorney to probate the Will and assist you in administering the estate, you should be aware that you are not legally bound to retain the attorney who drafted the Will or handled the decedent's affairs. Mitchell Wilensky - New York Estate Probate Inheritance Attorney: The estate, probate and trust law attorney, New York City, Manhattan, Bronx, Queens, Brooklyn, Nassau, Suffolk, Long Island, Westchester probate & estate attorney, estate administration & settlement lawyer, New York inheritance law & inheritance disputes, estate litigation, contested estates & trusts law office, New York Long Island probate, New York kinship hearings - representing heirs, administering estates and trusts, probating wills attorney, estate tax returns, estate & trust accountings, executors & trustees, or other legal information presented at this site should not be construed to be formal legal advice nor the formation of a lawyer or attorney client relationship. Any results set forth here were dependent on the facts of that case and the results will differ from case to case. Please contact our New York inheritance, probate, trust and estate law office - New York, NY. Attorney Advertising.